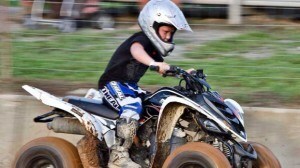 KidsATVsale.com » ATV Safety » Is Your Kids Ready For ATV Riding? Is there anything greater than spending a day outdoors riding a four-wheeler with your kid? Off-road riding, exploring new places will help you to maintain and strengthen parental and friendly relations with your children, and for the children themselves to acquire new skills and build up their self-confidence. But riding an ATV isn’t all about fun and pleasure. It also means some serious responsibilities for parents and youngsters. However small your ATV be, it’s still not a toy but quite a heavy and powerful machine demanding respectful treatment. So, the first question – is your kid ready to ride such vehicle at all? Is he or she big enough in any – and every – sense of the word? Nobody knows the answer to that question better than you do. Still, to help you come to a decision, consider some points as follows. Obviously, the safe riding demands that the rider should be of a proper height and have sufficiently long and strong arms and legs. Or it would be difficult to have a good view and to reach, get hold of and work the controls. To decide if it is so, ask your kid to sit on the ATV. Make sure he or she can easily reach the controls. Arms should be long enough for the kid to turn the handlebars to either right and left to all the possible angles without losing the grip on the handles or contact with the seat. Check if the kid’s hands are big and strong enough to maintain sure hold and easy operating of the hand controls such as throttle and brake levers. Is the kid comfortable with operating the foot controls? While riding, to get better view or balance, it is often necessary to rise from the seat. So the next check will be to see if your kid can stand on the footsteps keeping control over the ATV. The clearance between the seat of the vehicle and the buttocks should be at least three inches. No doubt, you’ve had lots of opportunities to find out if your daughter or son has such at the level demanded by ATV-riding. All in all, they are not much higher than what is necessary when riding a bicycle or skateboard or playing such games as soccer or baseball. The rider must react quickly and have a good coordination between eyesight and movements. Those qualities don’t come to us with the birth but develop and trained all the childhood and adolescence. So ask yourself: is your kid big enough in that sense? Parents (male parents especially) tend to overestimate their children when it comes to agility and physical maturity. Still more important is mental readiness for ATV riding. That includes not only quick thinking and a good estimation of the road (off-road) situation but also a well-developed understanding of cause-consequence connection and overall responsibility. Is it usual for your kid to analyze her or his mistakes and make the right conclusions for the future? Is he or she as a rule obedient following instructions? Haven’t you notice any unaccountable and risky doings on her or his part, and how grave they were? Be honest answering those questions. Remember – the safety of your child depends on it. 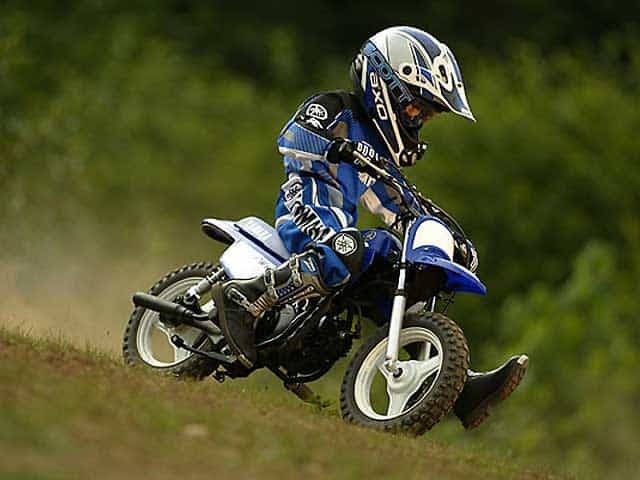 There may be good reasons to let your kid grow for a year or two before starting off-roading. Even the children of the same age can be of a very different size, strength, and capabilities. So the table we are putting below has the character of a general recommendation. Just be reasonable picking the ATV for you kid. The laws concerning ATV riding vary widely from state to state. Pay attention to such points of your state’s laws as age/use restrictions, helmet laws, operating ATV on public way, recreational and environmental limitations, and so on. ATV Safety Institute (ASI) provides ATV Rider Course for both children and adults in various places all over the US. At the course, you will learn how to check your ATV before riding and how to ride it under various conditions, how to avoid or overcome different obstacles. Also, you will be advised as to the choice of protective gear and be given the information on the law regulations valid in your state. Some tips about the best places to ride in your neighborhood will be of use, too. 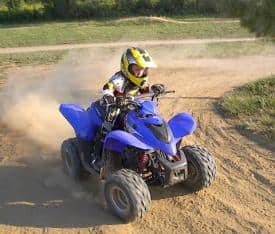 It is a good idea to take the course for yourself before buying an ATV for your kid so you could be more competent as a trainer afterward. If you buy a new ATV, your kid may be trained for free. But in any case, the fee will be quite modest. The constant presence of an adult relative is demanded during the entire course if the youngster is under 12. Otherwise, it is necessary only at the training site. The training is conducted only on ATVs suitable by size.